Throughout his nearly 45 years of private practice, Dr. Perry Goldberg has found that his educational background, one that combines both periodontics and prosthodontics, has given him an unusually well-rounded perspective in treating patients and makes him unique among the practitioners of his specialty here in Dallas. He's well-versed in the interactive biomechanics of how the oral and facial structures work together to allow healthy function. He's able to draw from a broad base of comparative patient cases and clinical outcomes from his decades of experience to determine what will and won't work and how to coordinate function along with the best in esthetics. For patients, this knowledge and experience works together to help him recognize and diagnose each patient's particular situation, create an appropriate, effective treatment plan, then apply the hands-on expertise required to carry the plan out successfully to create a healthy mouth and a beautiful smile. This enables him to provide the absolute best in what cosmetic dentistry of today has to offer built on a sound and healthy foundation. Dr. Goldberg is originally from Montreal, Canada where, in 1972, he earned his Doctor of Dental Surgery Degree (DDS) from McGill University Faculty of Dentistry. He graduated with numerous awards including the Montreal Dental Club Gold Medal for highest standing in his graduating class as well as the International College of Dentists Scholarship and the Alpha Omega Scholastic Award. Dr. Goldberg was then accepted into a combined Periodontal-Prosthodontic Program at the University of Washington in Seattle. There he completed two years of specialty training, earning both his Certificate of Proficiency in Fixed Prosthodontics and his Master of Science in Dentistry Degree (MSD) in 1974. He returned home to Montreal where he taught as an assistant professor on a part time basis in the department of Fixed Prosthodontics of McGill University for 19 years. For 23 years he also maintained a private practice in Montreal, limited essentially to Fixed Prosthodontics and, since 1985, implant dentistry as well. In 1997 Dr. Goldberg moved to Dallas where he now maintains a practice at Woodhill Medical similar to the one he had in Montreal. Dr. Goldberg has been a guest lecturer at Baylor and is a restorative advisor for several local dental study clubs. He is a member of numerous professional organizations and was elected a Fellow of both The American College of Dentists and The International College of Dentists, these being awarded to dentists for outstanding achievement and contributions to the dental profession in the fields of clinical practice, education and community service. He was also inducted as a Fellow in the prestigious Pierre Fauchard Academy, an international organization that recognizes excellence among dentists worldwide. In his 21 years in Dallas, he has been included on numerous occasions in the list of Super Dentists as published in the Texas Monthly, and chosen by his peers to be among D Magazine’s “Best Dentists in Dallas” 9 times since the inception of the award. Dr. Goldberg has lectured on a worldwide basis as a recognized authority on implant dentistry and oral rehabilitation, having spoken throughout the United States, Canada, Europe, Australia, New Zealand, the Orient and Guam. He has also published widely in numerous dental scientific journals both here in the United States and abroad. 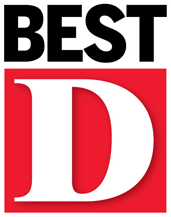 Dr. Goldberg has been named nine times as a Best Dentist in Dallas by D Magazine.